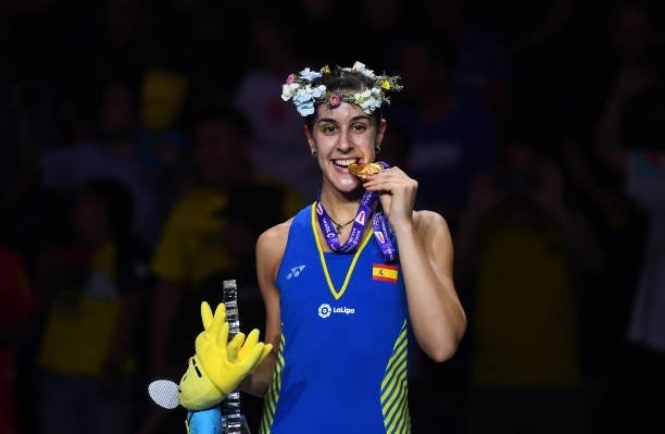 TASTING VICTORY: Spaniard Marin has made badminton history. SPAIN’s Carolina Marin has become the first woman ever to win three singles titles at the World Badminton Championships, with victory over India’s PV Sindhu. Mercurial Marin is now the reigning world and Olympic champion thanks to a thrilling 21-19, 21-10 win in Nanjing, China. The 25 year-old seventh seed added the 2018 crown to her titles in 2014 and 2015, as well as the Olympic gold she won from the unlucky Sindhu at Rio in 2016. It was more disappointment for Sindhu, who has endured a series of near-misses in recent times. The world number three was runner-up at the World Championships in Glasgow last year and the Commonwealth games in Australia earlier this year. Elsewhere, Kento Momota beat China’s Shi Yuqi 21-11, 21-13 to become the first Japanese man to win the world title.